Activate and increase electrical potential of cells and clean cells of unwanted waste. People with shellfish allergies should start out slowly or consult a physician before taking. There are no known side effects since chitosan and its oligosaccharide derivatives come from the shell, not the meat of the shell fish. There are also no known side effects when taken with medication. 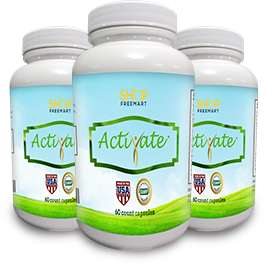 ShopFreeMart Activate is a food product not an herb or a drug and has no toxicity. If you are trying to lose weight, Activate should be taken 3x daily 30 minutes prior to meals with 8 or more ounces of water. If you do not need to be on a restrictive diet, take in between meals with a glass of water.